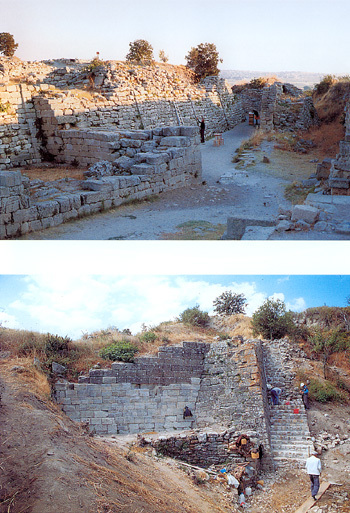 As also mentioned in the page relevant to the Trojan war, the recent discoveries occurred during the excavations in the archaeological site of Troy and the Hittite tablets indications seem to confirm that the location of the Homeric "well towered" citadel of Priam correspond to one of the stratified cities located in the hill we know today as Hisarlik . Even if since the ancient time this area was always know as the location of the Homeric Ilion, the archaeologists Frank Calvert and Heinrich Schliemann were the first to rediscovered and excavate the abandoned site in the 1870s. Schliemann embarked on two archaeological campaigns: The first from 1871 to 1873 and another from 1878 to 1879 (*1). His expedition dug the hill site and uncovered the ruins of ancient cities that dated from the Bronze Age through to the Roman period. For over a decade the site once again lay undisturbed until it was reopened in 1893 under the site direction of Wilhelm Dorpfeld and much later by Carl Blegen for six years between 1932 and 1938. It was not until 1988 that the Turkish University of Tubingen resumed excavations in conjunction with the University of Cincinnati (UC). Under the site direction of UC Professor Manfred Korfmann a substantial international team, comprising archaeologists and representatives from many other academic disciplines, has conducted excavations at the Troy site (*2). In the archaeological digging season of 2006, and armed with a new digging permit, the excavations at Troy continued after the death of Professor Manfred Korfmann under the direction of Ernst Pernicka, a friend and professional colleague of Korfmann. A special thank to the artist Christoph Haussner of the Troy Project team for the concession of some usefull reconstructive images of the ancient Troy. Troy I (about 3000 - 2600 BC): Initial settlement of the early bronze age. Construction material: sun - dried bricks. Troy II (about 2600 - 2400 BC): First settlement, where town plannig can be seen. Construction material: stones, sun - dried clay bricks. The most interesting building; The megaron house with pillars Center of contemporary civilization. Ended in a raging fire. Troy III (about 2400 - 2300 BC): Surrounded by walls. Construction material; stones. Buildings were larger and more developed than the previous period. 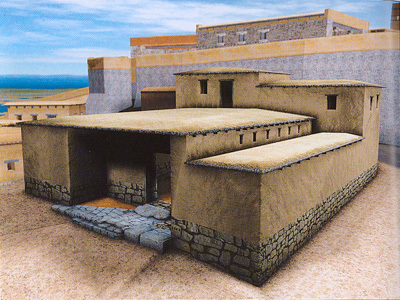 Troy IV (about 2300 - 1900 BC): Blocks of the houses were attached to each other. More advanced building techniques. Troy V (about 1900 - 1700 BC): More advanced techniques and workmanship in the construction of the walls and the houses. Troy VI (about 1700 - 1270 BC): Middle bronze age Prominent Acropolis of the period with its strong walls, and very well planned beatiful houses. Big leap in the construction techniques and fortifications compared to previous periods. 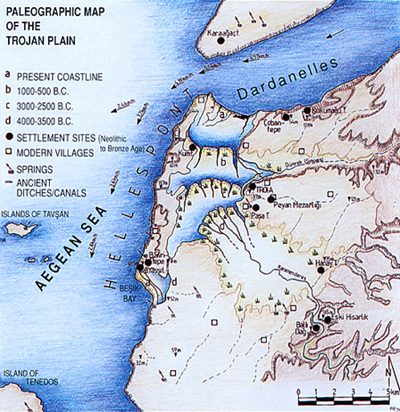 Excavations conducted by Wilhelm Doerpfeld in the 1890s indicated that the sixth stratum, representing the sixth settlement of the city, was the Homeric Troy, which could represents the legendary Trojan War. Troy VIi formerly Troy VIIa (about 1270 - 1200 BC): Large storage jars that were set deeply into the ground and covered with a heavy stone slab to store solid and liquid supplies for an emergency Advanced techniques in planing the city. 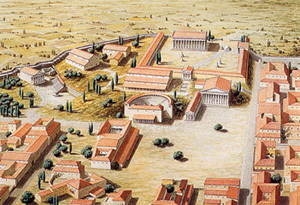 Later discoveries by the University of Cincinnati expedition under Carl W. Blegen claimed that, the this seventh level was more likely the Troy of Homer's period, which was the Priam's city. Troy VIIb1 (about 1200 - 1130 BC): Founded on Troy VIi (VIIa) Similar construction techniques with Troy VIi (VIIa) also this city phase ended in a raging fire. 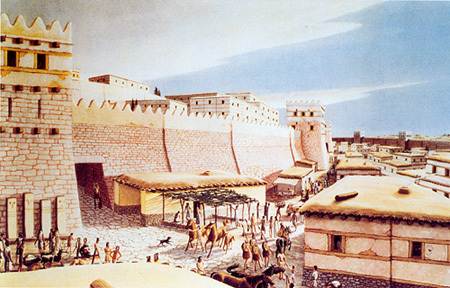 Troy VIIb2 (about 1130 - 1100 BC): New settlers, change in building technique with the use of orthostats in order to strengthen the lower courses of the walls. Phase VIIb2 was brought to an end by fire. 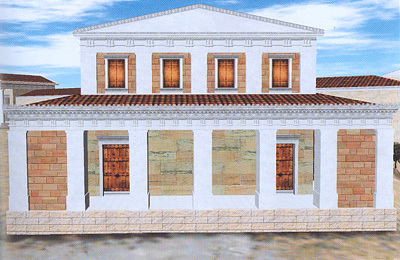 Troy VIIb3 (about 1100 - 950 BC): New reconstruction phase, the building technique comes back to the old tradition without the use of orthostats. Also this phase more likely ended in a raging fire. 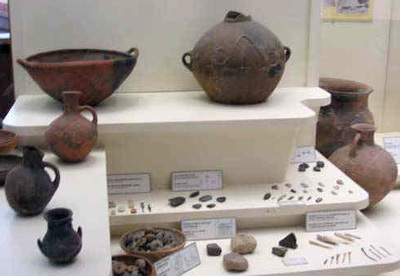 Troy of the geometric period (about 950 - 700 BC) Geometric phase partial reconstruction and pottery are so far attested in a limited area located in the lower part of the cittadel. Troy VIII (about 700 - 85 BC): Repopulated by Greeks from Lesbos and Tenedos. Remains of hellenistic and pre-hellenistic periods are visible The temple of Athena with its altar built in Doric order is the most prominent remain Later, taken over by the Romans. Troy IX (about 85 BC - 400 AD): The city spread and covered the whole mound Hisarlik Emperor Augustus rebuilt the city The temple of Athena was the most important building The Bouleuterion, theater, and the auditorium all dated from the Roman period. Troy X (about 400 AD - 1300 AD): During the Bizantine perion the Roman Ilium (Troy IX) becomed a provincial episcopal seat. It was damaged by eartquackes around 500 AD and the site was eventually abbandoned around the 1306 AD after the Ottoman invasion. Stone axes and other prehistoric remains have been found in several locations near Troy. These elements attested as the Troad area was inhabited since the neolithic period. This area is a fertile plain surrounded by mountain chain, full of water-springs and accrossed by rivers which flow into the dardanelles. At the time of first human settlements this area should have looked very different from today. In the north area a deep creek was present but it silts up through the centuries. The first evidences of human settlements, older than 5000 BC, have been found on the Kum Tepe hill which is located on the west side of the area where the hills, between the plain and the Aegean Sea, ended. In this area around 4800 BC an ancient village was located. The people of this village were mainly agriculturists, they made decorated pottery and copper tools. During the end of the IV millenium new populations reached the area. They were goats and sheeps breeder and they already know the lead and the bronze. Around the 3000 BC these population created a new settlement on the top of a 30 meters high prominence created by the coast expansion due to the sand transported by the rivers. This was the very early stage of the Troy culture. The earliest settlement had a total of eleven building-phases (Ia-Ik). It was an extremely small village, with rough stone circuit-walls with a thickess of 2.5 m strenghened up to 3 m in the later phase. 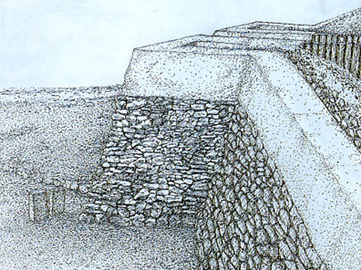 These early walls already had the distinct batter (a receding slope of about 45 degrees) on its outer face constructed using unworked limestone mortared together with clay, there is also evidence of a vertical parapet made of sun-dried mud-brick crowned this sloping wall. This vertical parapet was plastered in order to prevent its deterioration, besides this smooth sorface would have been not so easy to climb by the enemy forces. At least two entranceways allowed access from the landward side. The south gate, with four-cornered bastions, is one of the earliest gateway in Anatolia. The base of the bastions was composed of large stones that become progressively smaller, the structure itself becoming distinctly narrower as it gains height. In front of the bastion stood at least one stele with relief decoration showing the upper half of a human figure possibly holding a weapon. The tradition of such stelae seems to live on at Troy for centuries: a good 1000 years later such stone stelae re-appear in front of the south gate of Troy VI (see bellow section dedicated to Troy VI). Troy I: Stone foundation of one long-house During the first three years of excavation Schliemann had a deep North-South trench, forty metres wide and seventeen metres deep, dug through the centre of the mound. It was conceived as a test-trench, reaching down to bedrock, by means of which Schliemann hoped to find at what depth "Priam's Citadel" lay. Unfortunatelly in the course of this operation important building-remains from overlying layers were partially or wholly destroyed. At the bottom of the trench Schliemmann found remains of walls belonging to the Early Troa I period. These walls were made of sun-dried mud-bricks containing straw and resting on a foundation of stones. They were part of a series of close-set long houses among which House 102 is conspicuous for its size (18.75m by 7m) and form. Some of these elongate houses had porches. The roofs, of which nothing survives, were flat and covered with mud. In the larger house two separate infant burials were discovered just beneath the floor, one an inhumation in a shallow pit covered by a flat stone, the other an interment in a broken ceramic urn. Four graves of the same kind were exposed in the open space immediately north of the house, and the six skeletons found have all proved to be newborn babies, proving the rate of infant mortality was relatively high in early Troy. Pottery was handmade and generally in monochrome black or grey-green, even if decorated vase with zigzag or waves like motifs were also present. Spindle whorls, loom weights, and bone and copper needels of various sizes indicate that these people were familiar with weaving. Stone beads and ornaments, bone and stone idols, and the incised decoration encountered on backed clay pottery appear to have been their only contact with moulded art. A limestone relief of a human face is regarded as being the oldest example of sculpture encountered in the area so far. Weapons and tools were made from obsidian or flint or from raw copper or lead. Troy I (Copyright by Christoph Haussner Munich) The lifestyle of the early Trojans was mainly based on agricolture, stockbreeding and fishing but also hunting to a lesser degree. The diet was various based on beef meat, pork, sheep and goat meat but they also ate rabits, fawns, boars and wild birds. The early Troy population planted fields with spelt, barley, peas, lentils, chick-peas and broad-beans. For what concer the Sea food the people of Troy I ate molluscs, oysters, small fishes but also big ones like tunas or dolphins. The main means of transport were the small ships and if the chariots were already present these would have used oxes being the horses not yet present in the area. The Troy I culture has a distribution covering the coastal regions of the northern Aegean and Sea of Marmara. Trade and cultural connections are attested far into the Mediterranean, Europe and Anatolia. 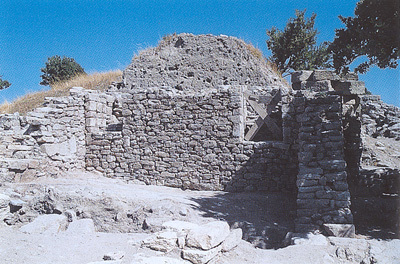 Archaeologists believed that probably the Troy I settlement ended with a fire. TROY II (Maritime Troia-culture; about 2600 - 2400 BC). Although Troy I was destroyed catastrophically, there was no break in the time sequence or any change in the culture between the two settlements. On the contrary, the culture of Troy I continued to develop in Troy II. This second town was the seat of an important prince or king, Troy II was solidly planned and strongly built on an area of no more thatn 9000 sq. m. The citadel was surrounded by fortifications wall about 330 metres long with stone base and mudbrick superstructure. To this citadel, however, there belonged a lower town, whose existence has been demonstrated in the recent excavations. After eight building phases (IIa-IIh) and many alterations to the fortificatons walls, it was twice destroyed by terrible conflagrations. The most important phases of Troy II are Troy IIc and Troy IIg (The "burnt city" in which Schliemann found, among other items, the famous "Priam's Treasure").With its precise plan, rarely encountered in other settlements of the period, Troy IIg is one of the most impressive monuments of the Eraly Bonze Age. It was originally considered by Schliemann to be the Troy described by Homer. However, Schliemann learned more in the course of his excavations and he probably recognised his mistake. Most architectural remains now visible here derive from Troy IIc. They include a row of three parallel long long-houses with porches, the so called megaron houses. The largest of these is Megaron IIA, measuring about 30 m x 14 m. In plant it can be regarded as a possible prototype of the Greek temple. The recent finds of cult amphora with idols in adoration gestures on the handles suggest that in its last phase (IIh) it was a place of culting activity. Access to the complex was through the large fortified south-east gate (Gate FO) and a smaller gate. An additional entrance (Gate FM) lay to the south-west. This gateway was approached by an impressive ramp paved with flat stones and flanked by mudbrick walls. But its size and position probably make the eastern gate, FO, a more plausible candidate for the main entrance to the citadel. There too there was presumably a stone ramp (unexavated) to overcome the difference in altitude between the approach-road and the settlement. Troy II "Priam's Treasure" To the left of gate FM Schliemann found the legendary "Priam's Treasure". 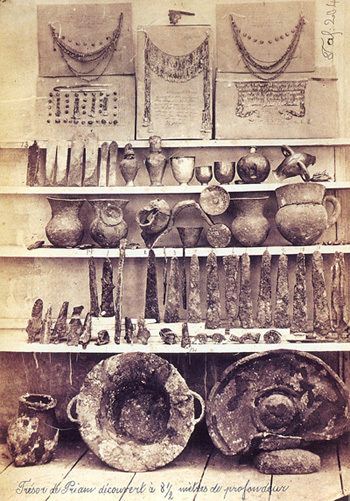 These treasure consisted of Jewellery and drinking vessels of gold, silver, electrum, bronze and copper. In the same strata Schliemann also found remains of weaponry like bronze and copper axes, daggers, swords, spear points and parts of helmets. Most unusual in these latitudes is the extensive use of the potter's wheel; likewise the possession of bronze, and alloy of copper and tin - a crucial prerequisite for the mass production of cast metal weapons and therefore for military superiority. These findings demonstrated that Troy II had extensive trading links reaching out in different areas. In particular, the jewllery are masterpieces of craftsmanship (granulation and filigree work, as well as enamelling) such as are rarely found outside Mesopotamia and Egypt during this period. The settlement obviously had very skilful metalworkers that presumably offered their services to foreign rules, traveling from one region to another. Among the metals they worked are gold, silver, lead, and copper-all found in Anatolia-and tin, which is thought to have been imported from the Zagros Mountains (southern Iran) or the Iberian Peninsula. Amongst the more mundane finds, pounding or grinding stone and decorated spindle whorls are numerous. The high number of sheep and goat bones confirms the expanding yarn and weaving industry. The inhabitants of Troy II probably utilised metal scissors to shear sheep and did not have to pluck them by hand as their Mesopotamia counterparts did. Beans, lentils or vetch and emmer wheat are known to have been added to the already existing food sources such as domestic animals and seafood. Most unusual in these latitudes is the extensive use of the potter's wheel. The archaeologists believe that Troy II suddenly succumbed to attack. The layer of destruction that represents the end of Troy IIg is on average 1m thick and bears all the hallmarks of a deliberate destruction. TROY III-V (Maritime and Anatolian culture; about 2400 - 1700 BC). Troy II was more likely destroyed by an internal insurection Since no evidence has been found of a change in culture during the subsequent settlements of Troy III-V. The Sovereigns of Troy II were probably killed or throwed out but the settlement was improved and restored with new houses inside the cittadel and at least two big building including a megaron. 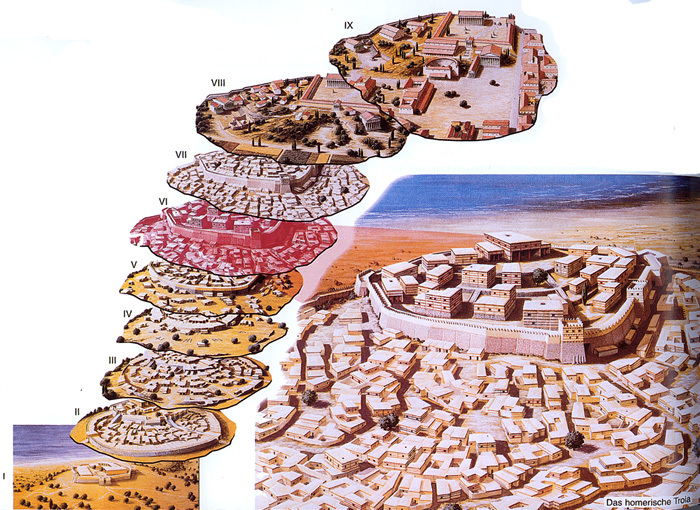 Over the centuries the citadel expanded to cover an area of 18,000 square metres (about 1.8ha), but there is not clearly evidence to indicate that the lower town continued to flourish. Schliemann at the beginning of his investigations mainly excavated the settlements of Troy III-V. But his sequence has now been further subdivided on the basis of the excavations of Blegen into four building phases in Troy III (IIIa-IIId), five in Troy IV (IVa-IVe), and four in Troy V (Va-Vd). In the light of his own excavations, Korfmann and the others Troy Project archaeologists now consider Troy I-III as one cultural unit, the "Maritime Troia Culture". The Troy III settlements was not so impoverished as previously believed. Probably more inhabitants were living inside the cittadel than in before Troy II. One of the larger house of this settlement was located near the south-east entrance of the cittadel. 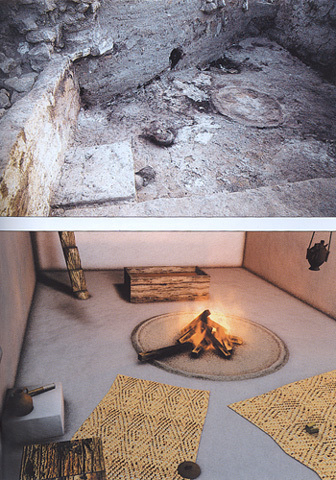 This building had a large megaron with a living area of 4.5x9 metres and a plastered fireplace of 1.2 metres in diameter. a probable cult altar and traces of straw mats have been also found. In this area some pottery have been discovered together several metal objects, small idols, and a ceramic sceptre more likely imported from Egypt. Around the 2300 BC Troy III was destroyed by and earthquake. Mostly of the original "maritime culture" population left the area and new migration peoples from the internal areas of the Anatolia occupied the settlement. 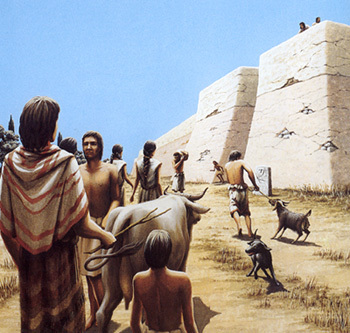 This new population was soon integrated with the native Troy culture, the settlement was restored now the blocks of the houses were attached to each other and more advanced building techniques were introduced. Despite the new population Troy IV gradual faded of the former glory and it declined in prosperity. Several fire destrucions occurred in this period as well as attack from external enemy or nomad raiders. 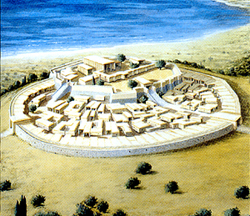 The life conditions of Troy inhabitants improved around the 1900 BC. New larger and better houses were builded, one of the Troy V house discovered had a living area of 5 x 10 metres with other adjacent rooms. The houses were much more furnished with fornitures or with plastered seats and podiums. Troy IV pottery New pottery production techniques were developed, typic of this period are the vases with a grey color and large craters decorated with red crosses and carved with white spirals. Hunting provides a markedly greater proportion of diet, with venison as the most popular kind of meat. The rather abrupt appearance of deer in appreciably greater numbers than before presumably mean that new methods of hunting had been developed, such as the acquisition of better deer hounds or the invention of more effective weapons of the hunt. Further improvement in the commercial trades are also attested mainly with the Aegean/Cyladic islands, Crete and Cyprus as well attested by several burial elements. Troy V was suddenly abandoned around the 1750 BC due to mysterious causes probably natural cataclysm or epidemics. Manfred Korfmann named the populations of Troy IV and Troy V as "Troia Anatolian Culture" which spead a period of about 600 years. A long period but with very few survided remains being the old settlements levels normaly destroyed by the new building phases. TROY VI (Trojan high culture; about 1700 - 1200 BC). 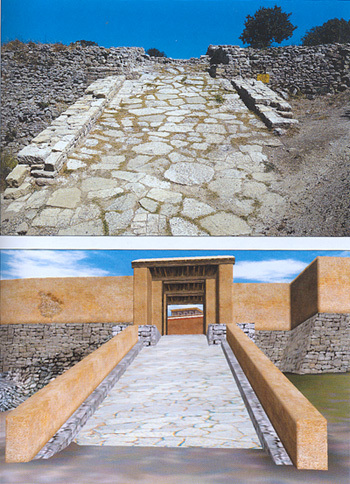 A completely new princely or royal citadel was built covering an area of 20.000 sq.m. in size, and probably in importance, it surpassed the citadel previously known at Hisarlik and all others so far investigated in western Asia Minor. Nine building-phases (VIa-VIi) could be identified (*3). The fortifications are in a new style and technically superior, consisting of gently sloping walls of ashlar masonry with offsets and massive towers. The Troy Project team had demonstrated the existence of a large lower town bordered by defensive instalation and impressive wooden structure. With a settlement covering an area of nearly 200.000 sq.m. Troy VI is now ten times larger than previously supposed. The fortifications around the citadel are in a new style, amounting to some 550m in lenght. The circuit-wall, which can still be seen today, is 4 to 5m thick and more than 6m high, it would have reached up a further 3 to 4m with its vertical mud-brick superstructure. (cf. Homer's "angle of the lofty walls", and "strong towered Ilios"). Five gateways and posterns led into the citadel, with the main gateway lying to the south flanked by a tower notable for the six monolithic stelae that stood along its front (cf. Homer's "Skaian Gate"). 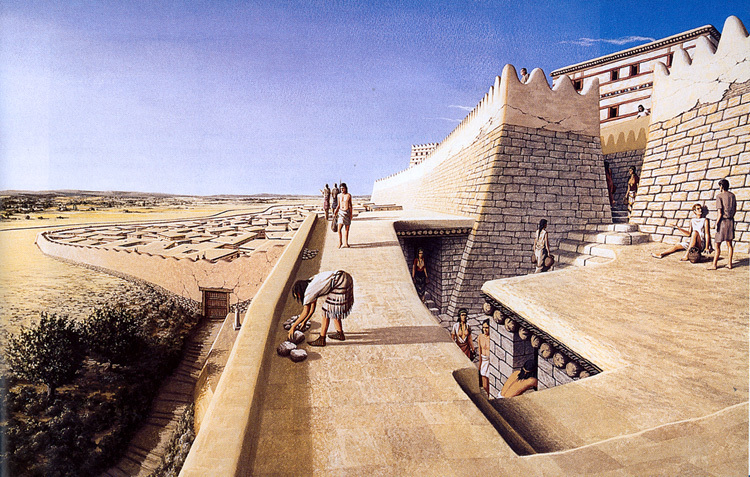 Behind the fortifications, buildings in the interior were disposed on three concentic terraces rising up towards the centre of the citadel mound. 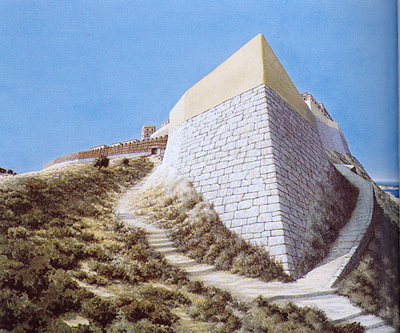 There were palatial free-standing buildings, including megara, sometimes two-storied and invariably trapezoidal in plan, with their shorter sides facing the summit and their longer sides facing the fortifications. (Copyright by Christoph Haussner Munich) The Northeast Tower, the most massive of Troy's bastions, belong to the heavily-fortified cotadel of Troy VI. The tower encloses a ten-metre-deep artesian well which was sunk during Troy VI and restored during Troy VII. This tower, which was also accessible from the outside, consisted of a large stone substructure measuring 18m x 8m and standing at least nine metres high (today only seven metres). On top was a superstructure of unbaked mudbrick, although what this looked like is not known. Of importance are also the House VI-E with its steep retaining wall of smooth-cut stones, and House VI-F with its stone supports and its recesses for stout wooden beams, while on the floor are 12 stone bases for pillars. Equally interesting is the once two-storied House VI-M with its L-shaped plan and its carefully built retaining wall, nearly 27m long, which once had a smoothly finished sloping outer face that was marked off by four vertical pffsets into five segments. 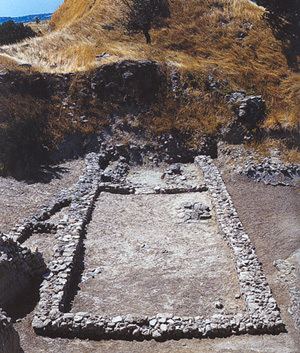 It is assumed that the royal residence lay on the summit, and House VI-M surely formed part of the Troy VI palace complex. 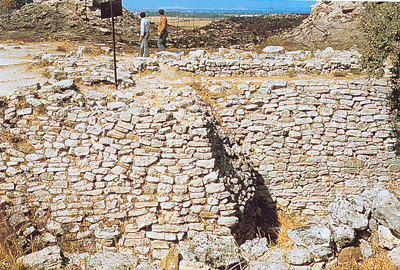 During the building phase VIh (around 1300 - 1250 BC) Troy was severely damaged by an earthquake, as is evident from the large vertical cracks in the surviving fortification walls. Nevertheless, Doerpfeld found evidence for fire or fires at various places in the destruction level of Troy VIh and saw this destruction as the work of men. Likewise Korfmann's excavation has also revealed signs of war, namely a thick charcoal layer dated roughly to 1250 BC, as well as slingshots, bronze spearheads and arrowheads scattered in debris and lodged in the fortification walls. 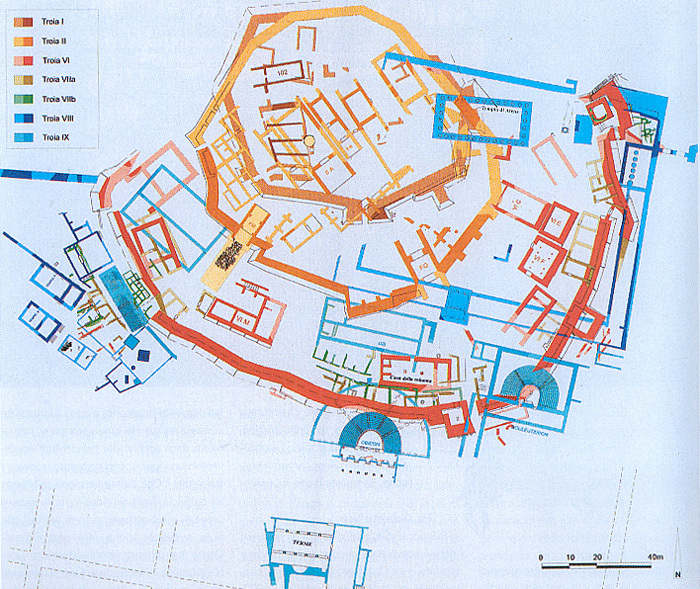 In 1988 Korfmann began a renewed attempt to find a lower town to the citadel of Troy VI. 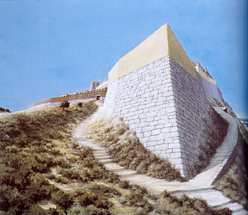 Its existence has since been demonstrated and it is now known that it was bordered by a defensive installation some 450m to the south of the citadel mound. "Negative" signs of impressive wooden structures have also been revealed and these are believed to be the houses that once crowded the lower town. 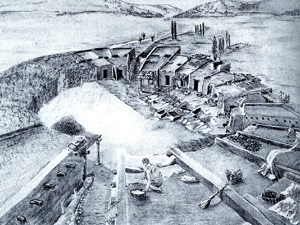 Additional evidences of the lower town and the defensive ditch have been found by the team of professor Ernst Pernicka. His team uncovered a trench 1.4 Km long, 4 meter wide and 2 meters deep. Furthermore trace of a southern gate, southeastern gate and southwestern gate have been also found. Parts of two ceramic "pithoi" were also found in the trench near the edge of the lower town, suggesting that houses in the lower town stretched to the trench, another indication that Troy's lower town was fully inhabited. With a settlement covering an area of nearly 2700.000 square metres (about 27ha) Troy VI is now 13 times larger than previously supposed. Its population has been estimated at between 5.000 to 10.000 inhabitants. These findings place Troy among the largest trading and palatial settlements of Anatolia and the Near East in this period. 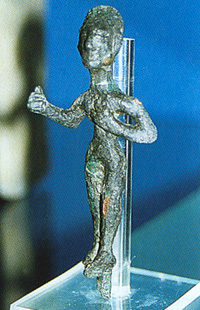 Troy VIi (formerly VIIa) bronze statuette The remains of houses of Troy VIh, together with parts of the citadel fortifications, were hastily repaired and reused and many new ones built in former empty spaces. There is not cultural break between Troy VIh and Troy VIi (formerly Troy VIIa) but, from the point of view of workmanship, a considerable drop in quality. For the new domestic structures are noticeably shabbier, smaller and more cramped, while the rebuilt houses are partioned. All the evidence points to an increase in populaton, and in the number of large storage vessels "pithoi" set deeply into the ground, inside the citadel. Some have attributed this phenomenon to the fact that the trojans of this period did not feel secure and thus had adopted a "siege mentality". Troy VIi was sacked and destructed by fire in a date between 1220 and 1180 BC. (more likely 1210 BC.). Human sketetons in the burned rubbish as well as arrowheads and slingshots have been found. The destruction by fire, the traces of bodies, the weaponry- put them together with the overcrowded conditions and the storage jars, give the image of a threatened community desperately laying in supplies to withstand a siege, and than the evidence of their final desctruction. As also described in the page related to the "Trojan war" the Troy of this period is also mentioned in some Hittite tablets with the name of Wilusa. This city was an important political-economical Luwian center and it was in fact, since 1290 to 1215 BC allied with the near Hittite empire. TROY VII (Balkanic/Troia-culture about 1200 - 950 BC). 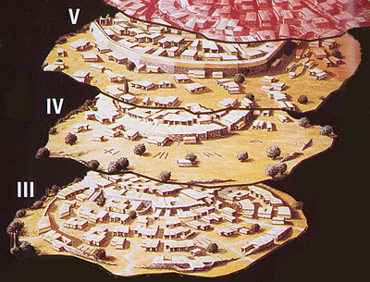 Troy VII phases VIIb1, VIIb2, and recebtly VIIb3 show continuity from what preceded them; for example, parts of the fortification walls remain in use. Yet there are significant new cultural elemens in both the lower and the upper levels. Handmade pottery suddenly re-appears after 1000 years of the potter's wheel. The lower parts of the walls are now faced with irregular, vertically-placed stone slabs. In the building-phases (VIIb1-VIIb2) there are also changes in wall-building techniques, with the lower parts of the circuit-wall now being faced with irregular, vertically placed stone slabs (orthostats). How Troy VII1b perished (around the 1130 BC) is unclear. There are not clear evidence of destruction whether by earthquake or by human hands and probably the settlement was taken over by a related cultural group without serious disturbance. Prominent amongst the handmade pottery is a striking dark-coloured ware decorated with ribs and knobs like horns, the so called knobbed ware or Buckelkeramik, for which analogies are to be found in south-eastern Europe. Similarly, a number of bronze axe heads found by Schliemann, although their context of discovery is not certain, have been attributed to Troy VIIb2 and have their best parallels in Late Bronze Age Hungary. Buckelkeramik has a parallels across the Hellespont it appears that its makers may have migrated into the Troad from Thrace, to which in turn they may have moved from further west. Troy VIIb2 was destroyed by fire. Conceivably the settlement was taken by force and put to the torch around 1100 BC. Troy VIIb Seal with Luwian inscriptions In a house of Troy VIIb2 located in the south-west area of the citadel the first Troy Bronze Age written evidence has been found. 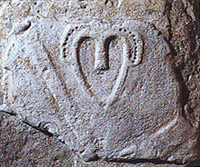 This seal probably belonged to a married couple shows Luwian simbols in its upper parts. 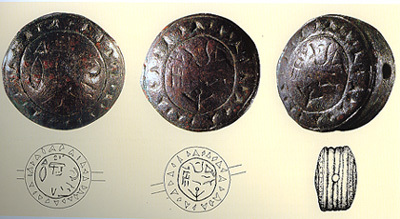 On the left side of the seal a terracotta tablet is visible with two stylized columns, these elements attested as more likely the husband was a clerk. After the destruction of Troy VIIb2 the settlemet had a further building phase (Troy VIIb3). The building techniques come back to the old tradition without the orthostats. 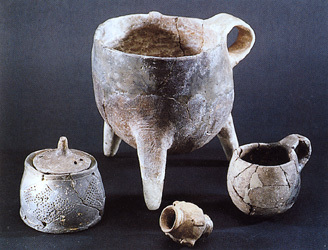 The Buckelkeramik was still produced but during this phase the Mycenaean pottery was replaced by a local variant of the proto-geometric pottery. Some two handles transport jars dated around 1025-950 BC with concentric red circles coming from the north-east area of the Greece have been also found. The few remains of this phase seem attested as Troy VIIb3 was also destroyed by fire. At the end of the first Iron Age the settlements was almost complete abandoned even if few peoples continued to live in Troy. 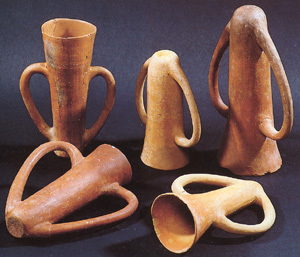 Some variants of the late proto-geometric pottery attested as the setlement was partially inhabited during the 10th, 9th and 8th Century BC. During the Geometric period building activity are so far attested only in one singol place near the citadel. TROY VIII (Archaic to Hellenistic culture about 700 - 85 BC). At the time when Homer lived, Aeolian Greeks from the north-western Aegean resettled the mostly abandoned site. Remains of Troy VI/VII monuments were incorporated in the newly erected fortification walls and houses. 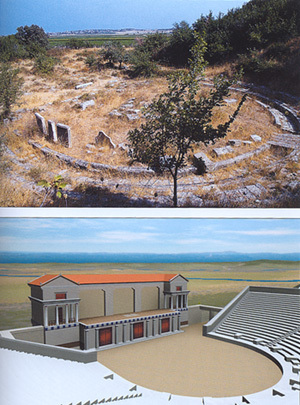 At first it was a modest settlement, although literary sources do mention a temple of Athena of this period despite its notable absence in the archaeological record in fact of the temple itself nothing remains apart from a few blocks from the substructures of the altars and some scattered marble components. Herodotos, for example, says that Xerxes, prior to crossing the Hellespont en route to conquer Greece "sacrificed a thousand oxen to the Trojan Athena". Almost 150 years later and having crossed the Hellespont in the opposite direction, Alexander the Great also made a pilgrimage to Troy. He went to the temple of Athena and , in the words of Arrian, " dedicated his full armour in the temple, and took down in its place some of the dedicated arms yet remaining from the Trojan war". 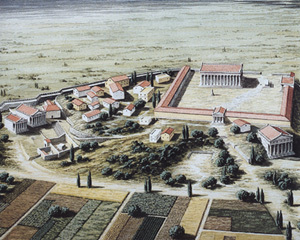 Later and especially in the time of Lysimachos, one of Alexander the Great's successors, there was deliberate veneration of the " sacred city of Ilion", with the building of a sanctuary dedicated to Cybele-Demeter outside the south-west and the rebuilding of the temple to Athena on the citadel mound. Of the later, nothing remains apart from a few block from the superstructures of the altars and some scattered marble components. When the temple was rebuilt, if not before, the central and most elevated buildings of Troy VI and VII were cut away. To the south a lower town of regular design extended over and among the ruins of the lower town of Troy VI/VII. In 85 BC during the war against , the site was thoroughly destroyed by the renegade Roman legate . It is said he afterwards boasted that he had done in 11 days what the Achaeans took ten years to accomplish. One Trojan wit responded by saying that they had not had Hector to defend the city. TROY IX-X (Roman/Bizantine culture about 85 BC - 1300 AD). C. Julius Caesar rebuilt Troy after a visit to the site in 48 BC. Indeed, the Romans had a very particular interest in Troy, tracing their ancestry back to the Trojan hero Aeneas, son of Aphodite. According to post-Homeric legend, Aeneas not only survived the sack of Troy but also fled to Latium in Italy. As a result, the Romans viewed the Trojan hero as their progenitor and believed Troy to be the "mother-city" of Rome. This belief is well documented on coins of Caesar, whose clan, developed their political ideology by claiming Iulus (Ascanius), son of Aeneas, as eponymous founder and thus descent from his divine grandmother Venus. Troy's chief landmark was the Doric temple of Athena, and this was rebuilt and enlarged, especially under Caesar's heir and successor Augustus. Of this monument there survive only the long section of the massive foundatons supporting the porticoes and surrounding walls of the 9.500 square metres rectangular sacred precinct. (*1) Dr. Henry Schliemann, TROY AND ITS REMAINS London John Murray, Albemarle Street (1875). (*2) Ege Yayinlari, A guide to Troia; Instambul (2001). Traum und Wirklichkeit, TROIA; Theiss 2001. Nic Fields, Donato Spedaliere, Sarah Sulemsohn, Troy 1700-1250 BC Osprey Publishing 2004. Birgit Brandau, Hartmut Schickert, Peter Jablonka, TROIA wie es wirklich aussah; Piper Verlag GmbH 2004.